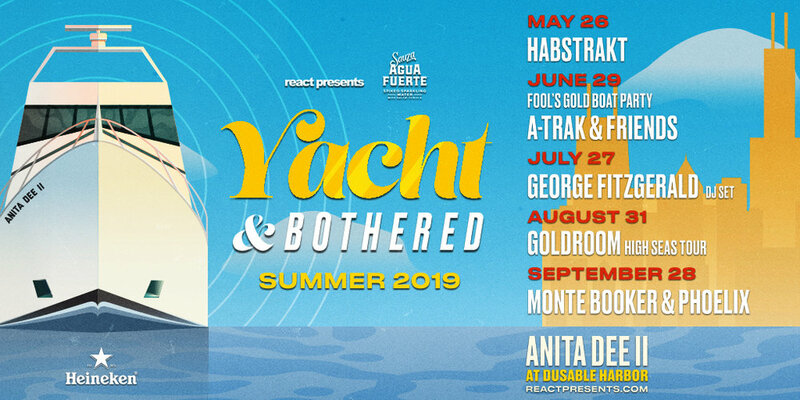 Pro-Ject is proud to announce Sauza Agua Fuerte (Spiked Sparkling Water with Sauza Tequila) and Heineken as the official partners of React Presents first-ever ‘Yacht & Bothered’ boat party series. Held May thru September 2019 aboard the gorgeous Anita Dee II (docking out of DuSable Harbor), this year’s incredible 2019 series includes DJ sets from Habstrakt, A-TRAK & Friends (Fool’s Gold Boat Party), George Fitzgerald, Goldroom (High Seas Tour), Monte Booker & Phoelix and a Special Guest DJ TBA. Set sail along the Chicago coastline on Lake Michigan with dance beats and Sauza Auga Fuerte! Sauza Auga Fuerte is a ready-to-drink, spiked sparkling water that’s made with Sauza Silver Tequila, natural fruit essence and no artificial sweeteners for a slightly sweet, refreshing cocktail. Available flavors include Lime, Mango and Grapefruit, each at 5% alc/vol. We’d like to thank Sauza Tequila and Beam Suntory for their continued partnership! This year React Presents is offering the Captain Pass, which grants you express entry to all shows and some other nautical goods (including one (1) complimentary Sauza Agua Fuerte per pass). Captain Pass tickets are available for purchase here.